While socialism informs our perspective on politics and the economy, we act in concert with socially and politically progressive people in the Tallahassee area. Listed here are websites of organizations with which we have a strong working partnership. 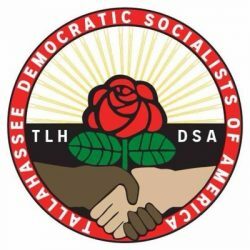 www.dsausa.org: The Democratic Socialists of America, TLH DSA’s parent organization, is a political and activist organization, not a party, with campus and community-based chapters that use a variety of tactics, from legislative to direct action, to fight for reforms that empower working people. The site is a rich resource of socialist history, analysis and news. www.bigbenddpc.org: Big Bend Democratic Progressive Caucus is a partisan organization building grassroots leadership and working to create a progressive majority within the Florida Democratic Party and beyond. BBDPC is the organized ‘Bernie wing’ of the local Democratic Party.